HITACHI INTRODUCES HIGH SPEED SMALL CHARACTER INKJET PRINTERS : News Releases : Hitachi America, Ltd.
TARRYTOWN, NY, May 8, 2006-- Hitachi America, Ltd., Industrial Systems Division introduces the PXR-H Series high-speed small-character inkjet printer. Hitachi has been building small character inkjet printers since 1975. 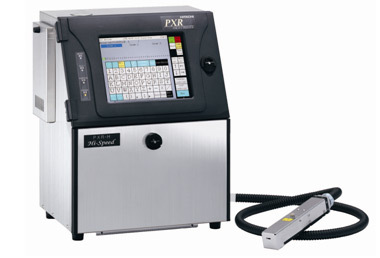 The PXR-H Series small character inkjet printer has the highest printing speed of 1,300 ft/min. for 1-line inkjet printing in its class. While dramatically increasing the speed, it maintains or even enhances the print quality by improving print-head and ink-drop charge/deflection control. The PXR-H Series small character inkjet printer deploys a 10.4” large Color TFT LCD Touch Panel with full guidance on the screen providing easy and quick operation and maintenance. The PXR Series’ small character inkjet printers’ unique and innovative ink circulation system helps reduce fluid evaporation and achieves a very low cost of operation. Nozzle and gutter are automatically cleaned before shut down; hence no special procedures are required at start up. The PXR Series small character inkjet printer viscosity and density control provides stable ink drop formation and keeps print quality high. The IP55 rated stainless steel enclosure provides full protection against dust and water. With its IJP- RST1 option, PXR small character inkjet printers can easily have Ethernet® connectivity at an inexpensive cost, which will further improve production efficiency. For further information contact Hitachi America at inkjetprinters@hal.hitachi.com or visit us online at www.hitachi.us/ijp. To learn more, please visit Hitachi America at Wire Expo, May 22-24, 2006 and East Pack 2006, June 6-8, 2006, Jacobs K. Javits Convention Center, New York, NY.